IHS Markit says that 70% of TV sales in 2018 will include smart TV functionality. The integrated functionality should make it very popular with owners. So why is it that streaming media player owners watch 77% more online video on TV than smart TV owners? Interactivity mandates in Brazil and Argentina. The most popular operating system powering smart TVs is Android, according to IHS Markit. Google’s TV platform, in the form of Android TV and modified versions in many Chinese TV brands, has a 40% share of the market. Samsung’s Tizen is second with 23%, LG’s WebOS is third with 13%, and Roku has a 6% share. In the US, despite the continuing success in selling smart TVs, consumers still prefer to use streaming media players (SMPs) to watch. According to comScore, 77% of SMP owners stream to their TVs while 70% of smart TV owners do the same. More telling is the disparity in time spent streaming video. The 33.6 million streaming homes use an SMP spent 53 hours watching in April 2018. 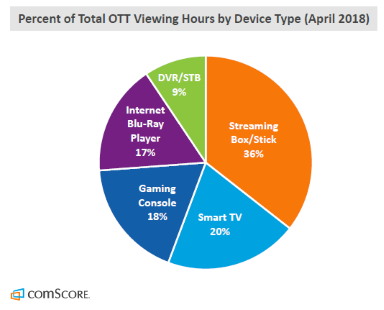 The 24.3 million smart TV streaming homes watched 30 hours, or 43% less than SMP households. Why do smart TV streamers watch less? It would seem much easier for a consumer with a smart TV to use it to stream video. 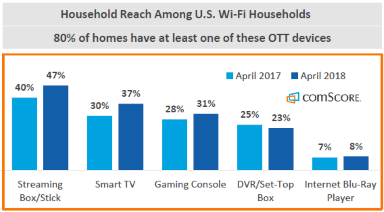 However, fewer smart TV owners use their device than SMP owners. More perplexing is the big disparity in time spent viewing. SMP users watch 77% longer than smart TV users. The reason for these sharp differences could be the same in both cases. Those people with older Samsung and LG smart TVs are likely not using the built-in functionality anymore. Samsung and LG revise their TV OSs frequently, and video providers understandably focus their attention on the latest versions. Over time, TVs running older versions of the OS receive few updates to video apps. Since the apps don’t have the latest features, they don’t provide a great user experience. How does a poor user experience impact viewing time? An older version of the Netflix app may lack binge features like autoplay of the next episode in a series, or voice search and discovery support. Such features help keep people viewing longer. Eventually, consumers will discover a new service that doesn’t support their older smart TV. They may also grow tired of the poor user experience. To fix the situation, they have two choices: buy or a new TV or, more likely, buy a $50 Roku. Most TV sales now include smart functionality, but consumers still prefer streaming media players. As TVs age, video providers stop supporting them but continue to support popular SMP platforms like Roku and Amazon Fire TV. Experiences on older smart TVs lack new features that encourage viewing, so people watch less and eventually buy an SMP.